My series of work that I entitled Morph (using Roman numerals, which I’d never do again!) was inspired by an extension of Up Draft, Down Force, and Escher Tide. Morph then, was just that – a morphing or changing of previous designs into something new. 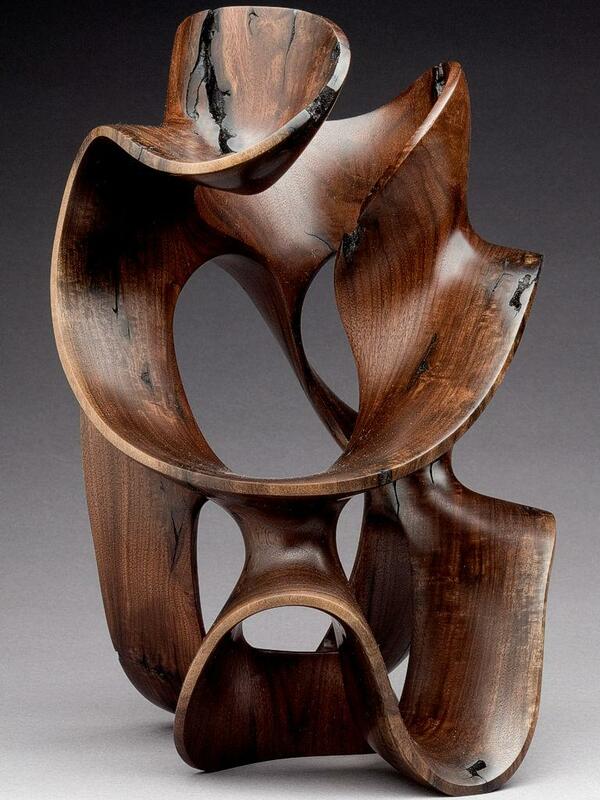 This first piece in the series is a hybrid of my ribbon work wood sculptures. I based Morph II on the same concept as Morph, but used a larger diameter piece of wood to see what would develop. Morph III is building off of its two predecessors. Although ribbonesque, the interconnectedness of this piece really lit the fire for the rest of the series in wood and then on into my glass cross-over. I really felt like I had reached a new form that resonated with my soul. The twists, turns and connections had matured and solidified. I subtitled Morph III as “Gotcha” – celebrating that “something” I had long sought, like the sweet sound of a baseball dead center on the bat. From this point on into the series, I was chasing the “sweet spot” and – well – morphing and exploring. How far can I push it? What new expressions are there? More to tell, more to come. The links below take you to the detailed information on each piece — in a new window. That’s a procedure we normally try to avoid…but couldn’t in this case. And, no, there’s nothing wrong with your Roman Numeral count…we avoided XIII for any superstitious folks out there.